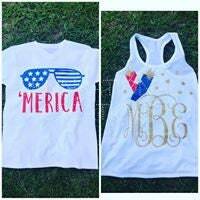 These shirts are perfect for celebrating July 4th, Memorial Day, and much more. They are cute and festive. You have two options a regular tshirt or a tank top. You can choose your design from the America Sunglasses or the Monogrammed Firecracker. Both designs come on a white shirt. Please list the monogram in the order it should appear... first, LAST, middle.